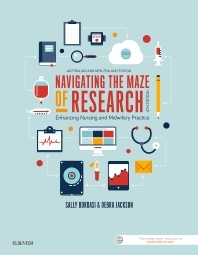 Written for the undergraduate nursing and midwifery student, the fourth edition of Navigating the Maze of Research: Enhancing Nursing and Midwifery Practice introduces the research process and provides insight into both how and why research is conducted. For this fourth edition, authors Sally Borbasi and Debrah Jackson highlight the connection between research, critical evaluation of findings and the use of these findings to inform and improve clinical practice. Borbasi and Jackson’s Navigating the Maze of Research is divided into three sections guiding the beginner to confidently engage in the research process and arrive at considered, informed clinical practice. Section 1: Defines key concepts and the research process while highlighting considerations such as ethics and traditional and non-traditional information sources. Section 2: Introduces the vocabulary of research and fundamentals of research design types – quantitative, qualitative and mixed method. New to this section is the important paradigm of Indigenous perspectives. Section 3: Provides steps for appraising research and translating knowledge into practice. Research and knowledge: What does the future hold for nursing and midwifery research?